Caudata.org gets a lot of questions about how to treat sick newts, salamanders, and axolotls. Reliable information about treating amphibian illness is hard to find. Most pet shops don’t have a clue (but are very happy to sell you their favorite product), and even veterinarians are unlikely to have much training or experience with amphibians. The following pages have been compiled in an attempt to tell you some things that other people have experienced. We would be happy to hear any suggestions for improvement of this information. Keep in mind that most illnesses in amphibians are multi-factorial. It is very rare to be able to state a single cause. For example, poor water quality plus warm temperature may cause illness more readily than either factor alone. A viral infection may be complicated by a secondary bacterial or fungal infection. Never jump to a conclusion about the cause; it is likely that there are several. Disclaimer: Caudata.org and the authors of this article accept NO responsibility for the success or failure of any treatments mentioned in this article. This article is NOT intended to give medical advice for treating animals, as this should be left to professional veterinarians. The list below is simply a list of some symptoms and illnesses commonly reported. The ones near the top of the list are those most commonly mentioned on the forum. We suggest that you search the archives of the Caudata.org forum for specific discussions. Note: many of the items in this list are symptoms, not diseases. When the root cause is unknown, it may be difficult to diagnose the problem, and thus impossible to choose a rational treatment. Bloat See Bloat in newts. Injuries from tankmates Isolate animal. Limb rot Usually noticed as the disappearance of a toe, foot, or leg. Common in wild-caught pet store animals, especially firebelly newts. Usually associated with recent importation and/or poor overall condition of the animal. Skin ulcers, sores Common in wild-caught pet store animals. Usually associated with recent importation and/or poor overall condition of the animal. See Treatment of infected wounds. Fungal infections In fully aquatic species, such as axolotls, may appear as fuzzy or stringy white material. In other caudates, often difficult to distinguish from bacterial or viral infection. Typically treated with salt baths and/or refrigeration. Bacterial and viral infections Usually impossible to distinguish between bacterial and viral infection. Swollen throat Can be (1) a form of bloat, or (2) oral infection (mouth rot, infectious stomatitis). Cloudy eye(s) Can be due to (1) injury (2) infection (3) diet (4) shedding problem (5) exposure to toxin. Flakey skin; abnormal shedding Often a sign of a sick or stressed animal. Can have many causes. Intestinal impaction Reported in axolotls, tiger salamanders, and other caudates that gulp their food; prevented by avoiding stones or gravel that can be swallowed. Metabolic bone disease (MBD) Prevalence in caudates unknown; may be the cause of some spinal deformities and some unexplained deaths, particularly in cases where an established animal stops eating. Improve diet, particularly calcium:phosphorous ratio and vitamins A and D.
Parasites Internal or external; include mites, nematodes, anchor worm, etc. Prolapse of the cloaca Considered a medical emergency (unlikely to correct itself). Must be pushed gently back into position; generally requires the assistance of a vet. Gas bubble disease Air bubbles under the skin. Can result from supersaturation of the water with gas; prevented by aging tap water before use. This is a list of medications that have been used on amphibians. We recommend that you get as much information as much as possible before using any treatment. Also see the “Health” page at Axolotl.org (linked below), which contains a list of safe and unsafe medications for salamanders. The availability of specific drugs varies from country to country. Many require assistance from a veterinarian. Note that antibiotics should be used sparingly. Antibiotics are associated with environmental risks (when released into the environment), social risks (antibiotic resistance), and risks to the animal itself. Although this list contains many varieties of antibiotics, this does not necessarily mean that this is what's recommended. Salt baths See Salt solutions for treating amphibian illness. Refrigeration Scientifically-substantiated as an aid in healing in caudates. Inhibits growth of pathogens without inhibiting the animal's immune system. Appropriate temperature and duration depends on the species, but the temperature of a normal household refrigerator is usually OK.
Calcium gluconate Diluted and applied as 2% solution for emergency medical support to amphibians. Applied directly to the skin twice per day. Replenishes calcium and also provides energy (glucose). Available from any vet, or from other sources, including eBay and vet suppliers. For more information, see article on Emergency Supportive Care on Dendroboard. Dimilin (diflubenzuron) Used for treatment of anchor worm and other external parasites. See forum thread with specific dosing information. Dirt quarantine In some cases, semi-aquatic animals may be better able to fight infection if moved to a terrestrial environment. See Treatment of infected wounds. Amputation As many caudates are able to regenerate lost legs and tails, amputation can be used to treat injury or limb rot. Should be done by a vet. Methylene blue Used to treat fungus (particularly on eggs) and some external parasites, such as ich and costia. Widely used for pet fish. Kanamycin (kanacyn) Broad-spectrum antibiotic sold for aquarium fish. Nitrofurazone (nitrofura, Furacyn) Broad-spectrum antibiotic sold for aquarium fish. Triple Sulfa (tri-sulfa) Broad-spectrum antibiotic sold for aquarium fish. Active against both bacteria and fungus. Active Ingredients: sulfamethazine, sulfacetamide, and sulfathiazole. Triple-antibiotic ointment Topical ointment sold as a first aid product for humans. Sold in the USA under trade names such as Neosporin. Caution: Do not use products containing local anesthetic pain relievers (e.g., benzocaine, pramoxine, etc.) as these may be deadly to amphibians. In the USA, one such product is Neosporin + Pain Relief Cream, which contains pramoxine. Melafix Caution: This product is related to turpentine. Its safety for amphibians is unknown, and its effectiveness is questionable. See forum thread. Furan-2 Broad-spectrum antibiotic sold for aquarium fish. Active ingredients: nitrofurazone, furazolidone, methylene blue. Myxazin Broad-spectrum bactericide sold for aquarium fish. Betadine, Rid Rot See forum thread discussing hydrogen peroxide and Betadine. Caution: Iodine-based treatments are potentially toxic. In addition, any preparation containing detergent may cause additional toxicity. Mercurochrome Caution: Contains mercury. Has been used safely in amphibians, and is recommended by the Axolotl Colony. Safety in humans is controversial; not sold in USA. Polymyxin E (colistin sulfate) An antibiotic used to treat livestock. Effective against gram-negative bacteria. Used topically, not injected. Silvadene cream (silver sulfadiazine) A sulfa-derived antibiotic with both anti-bacterial and anti-fungal activity. Used topically in treating skin lesions. Gentamicin (gentamycin) Caution: Ophthalmic preparation has been reported to have high risk of overdose. Still recommended by some sources, but safer options exist. Bactoderm Topical cream prescribed to treat sores on animals. Baytril (enrofloxacin) Broad-spectrum prescription antibiotic administed by injection or externally. Although commonly given by vets, it is not the treatment of choice for amphibians. It is cytotoxic, nephrotoxic, and less effective than some other antibiotics. Amikacin Combination of amikacin + pipercillin is a combination of choice, more effective than kanamycin. Timentin Newer alternative to amikacin. Flagyl (metronidazole) Treats anaerobic internal parasites, such as amoebae. Panacur (fenbendazole) Treats certain internal parasites, particularly worms. Formalin (formaldehyde) External parasites and other skin problems. See Eisthen Lab animal care methods. Axolotl.org Health Page - includes a list of safe and unsafe medications for salamanders. Amphibian Medicine Tutorials by the American Association of Zoo Veterinarians. Merck Veterinary Manual: Disorders and Diseases of Amphibians article by Brent R. Whitaker, MS, DVM. The Practical Axolotl - by Sandra Borland; advice on axolotl treatments, including refrigeration, salt baths, and pet shop medications (see p. 17 of the PDF). Article on Metabolic Bone Disease by Ed Kowalski, herpetologist at the Philadelphia Zoo. 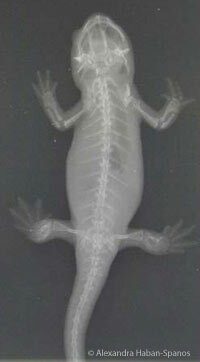 Mandarin Salamander page - Includes information on treatment of newly-imported Tylototriton. Emergency Supportive Care for Frogs article on Dendoboard.com. Introduction to Amphibian Medicine by Norin Chai, Outdoor Vets. Association of Reptile and Amphibian Veterinarians, see "Find a Vet"
Wright, K. M. & B. R. Whitaker. 2001. Amphibian Medicine and Captive Husbandry. Kreiger Publishing. This book is the authoritative resource on amphibian medicine. If you have many amphibians, this book may be worth the investment. Indiviglio, F. 1997. Newts and Salamanders. Barron’s. An excellent introductory book, which includes a decent section on diseases. Mader, G. Reptile Medicine and Surgery. Staniszewski, M. 1995. Amphibians in Captivity. TFH Publications. A large book with excellent photos, including photos of amphibian diseases and information on treatment. Assembled by Jennifer Macke, October 2006. Contributors: Frank Pasmans, Ed Kowalski.